SAL DeTRAGLIA'S VIRTUAL TAPAS BAR: A SHORT PRIMER ON SPANISH CHURROS. My father-in-law attributes much of the blame for his recent heart bypass surgery to 72 years of eating churros. I’d be willing to bet, however, that he views this as an equitable trade-off. Churros – those heavenly little pastries that, if eaten without restraint, can send you to heaven much earlier than expected – are nothing more than fried dough sticks. Flour, eggs, salt, baking powder and water are mixed into a dough and piped through a star-shaped nozzle to form ridged, little logs. The dough logs are deep-fried in olive oil until golden brown, drained and lightly sprinkled with sugar. Unlike their Mexican counterpart, churros in Spain are never dusted with cinnamon or filled with cream. Fresh, well-made churros have a crispy crust and tender core. They should be neither oily nor rubbery nor pasty, and are best eaten as soon as possible after frying. They are addictive little bastards that, when paired with a café con leche or cup of hot chocolate, form the basis of many a Spaniard’s morning meal. Certainly healthier than a breakfast cigarette, but a far cry from oat bran or Actimel®. Churros are easy to find throughout Spain, although they go by different names in different regions. Catalans call them “xurros.” Sevillanos call them “calentijos” or “tejeringos.” No matter. They all look the same. Many bars will display a tray of churros during morning hours…but be careful. If you are ever to eat a churro with the texture of a garden hose and the mouthfeel of oil-soaked cardboard, it’s likely to be in a bar. But don’t let me discourage you. There are plenty of bars in Spain that serve-up a damn crispy churro. You just need to find them. Look for bars that have a high churro turnover, which assures that fresh trays are brought out at regular intervals. A chubby clientele is usually a good indicator of this. When a new tray is laid on the bar, order quickly. You will want those prized churros sitting on top of the pile, rather than the ones underneath acting as de facto oil sponges. Or better yet, look for a bar that makes its own churros in the back kitchen. There aren’t a lot of these, but they do exist. The best place to buy churros, however, is in a churrería. Churrerías are little storefronts in which a mom or pop – often with faces that are amazingly well-preserved thanks to years of hovering over a steamy vat of olive oil – dedicate their lives to the art of perfectly frying churros, potato chips and other crunchy goodies that have never crossed the lips of Ally McBeal. Patronizing a churrería is the surest way to get the most crispy, fresh and tender churros possible. And it’s the only way to get a hot churro that’s never seen the inside of a microwave oven. But alas, there is a downside to churrerías: no coffee. Coffee is important, as I will now explain. HOW DO I EAT THEM? 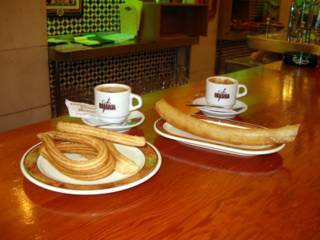 Churros are best eaten with a café con leche or cup of hot chocolate. Before continuing, however, I should clarify one thing. When I say “hot chocolate,” I am not talking about the insipid, Swiss Miss-type chocolate that is popular in the US. Rather, the hot chocolate served in Spain resembles a thick, dark, gooey mass of molten chocolate pudding. It’s an intense, face-puckering drink that you might be tempted to chew before swallowing. And man, is it good! But back to the point. You must dip the churro into your coffee or chocolate, utter the word “Zubizareta” (not because it has any special relevance, but because the time it takes to say it is more or less the optimal soaking time), pull it out and bite it. The contrasting flavors of salty dough, sweet sugar and bitter coffee or chocolate mesh together amazingly well. And if the churro is fresh, it will still crunch despite the soaking you’ve just given it. So forget what you learned in business school. THIS is what synergy is all about. And by the way…if you – like me – are one of those persnickety people who is mortified by the sight of crumbs floating in his drink, stop worrying. Churros don’t leave any crumbs behind in the coffee. An oil slick, yes; but crumbs, no. I’VE GOTTA HAVE SOME! BUT FROM WHERE? It’s now time to put all this theory into practice. At the risk of panicking the cardiologists of Spain (or, alternatively, in the interest of enriching them), here are a few of my father-in-law’s favorite churro joints in Madrid. - Churrería San Ginés: Located on Pasaje San Ginés, where it crosses Calle Arenal. Extremely popular spot for New Year’s Eve revelers seeking hot chocolate and churros before going home to sleep it off. - Chocolatería Valor: Located on Calle de Conde de Peñalver. Specializes in hot chocolate, but serves great churros as well. - Fábrica de Churros y Patatas Fritas: Located on Avenida de Felipe II (Plaza de Dalí), near the Goya El Corte Inglés. ALRIGHT SAL, LET’S WRAP IT UP! So there you have it. Everything you need to know about churros. If – despite my praise – you still feel apprehensive about eating this fat-filled, high-carb little devil, then perhaps I can offer a brainstorm. Why not drink a glass of red wine for every churro eaten each day? I’ll bet the French do it; assuming they have churros in France. I’ll bet Julia Child would do it; if only she were alive today. It’s a pity that my father-in-law didn’t do it. Hmmm…on second thought, I’ll bet he did. Your father in law appreciates very much the great elegía you write on churros, anyhow a God's "manjar". You should know that I left Chicago when I realized that was impossible to get authentic churros for brekfast. P.S. Dora la Exploradora has been invited to visit Spain by the National Churro Council to compare our product with the mexican stuff. If you had stayed in Chicago, you could be enjoying fat-free, low-carb churros today. Then again, you might not be satisfied with them. They're made of styrofoam. i was in spain for abt a year and the bits that keeps on blinking in my mind is that wicked churros con chocolate en Valor. Que bueno,tio!Oh,oh, and those fartons and horchata,too! One of the best drink on one hot and scorchy day!